Though it’s officially spring season, the weather here in Philly is still on the wintery side. It seems fitting to celebrate this new season with a wintery dish. 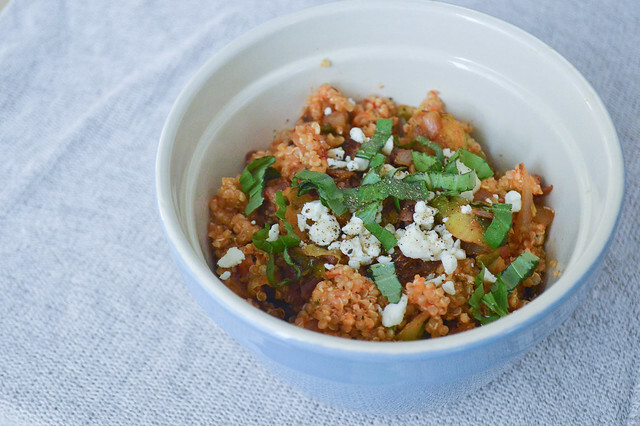 Quinoa bowls are always amazing when it comes to warming you up. They’re hearty, healthy and make you feel good inside. This specific bowl is amazing thanks to the refreshing apple cider vinaigrette. It adds a nice fruity taste to the delicious caramelized vegetables. As per usual, I roast my veggies in big batches over the week end so that this type of recipes only take me 10 minutes to prepare on week days. 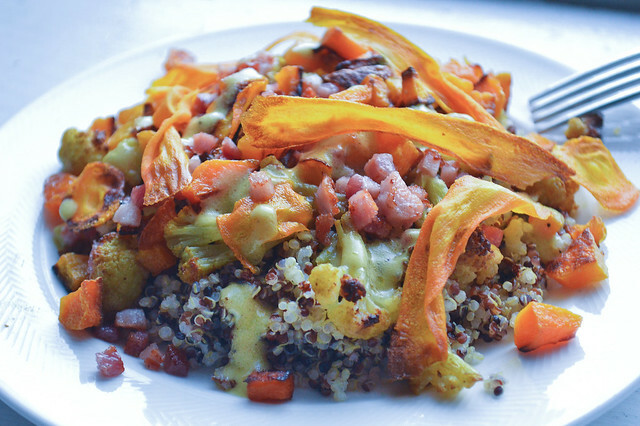 This recipe is perfect if you want to indulge in a wintery dish on this cold spring beginning, or if you feel like trying a new quinoa dish. Bon appétit! If you haven’t pre-roasted your vegetables, preheat the oven to 400°F. 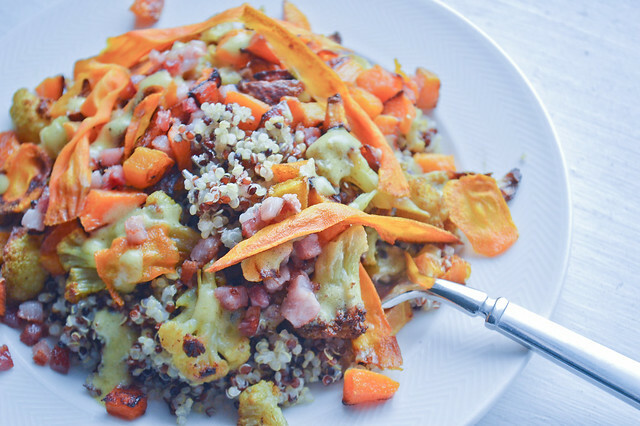 Toss the cauliflower, butternut squash and carrot ribbons with olive oil and roast until tender and caramelized (about 40 minutes for the cauliflower and butternut squash, and 4 minutes for the carrot ribbons). Cover the dried quinoa with ½ cup water, and cook until the water is absorbed and the grains are tender (about 15 minutes). Meanwhile, cook the pancetta until brown and slightly crispy, in a dry pan over medium-high heat. This should take about 5 minutes. Make the apple cider vinaigrette by mixing the mustard and apple cider vinegar together first. Then add the olive oil and mix until homogeneous. 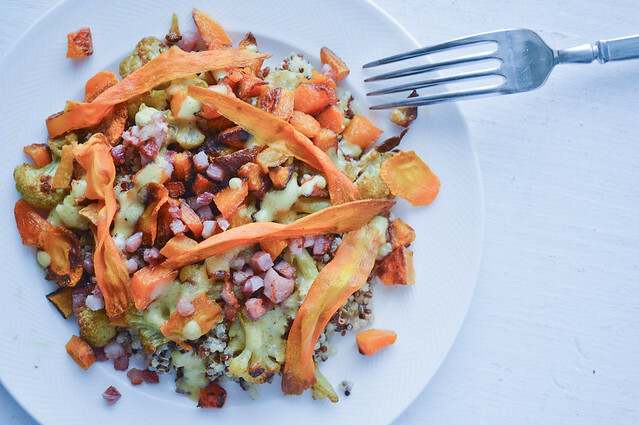 When the quinoa is ready, add it to the bowl, and toss with the dressing, crispy pancetta and roasted cauliflower, butternut squash, and carrot ribbons. Adjust the seasoning and enjoy! 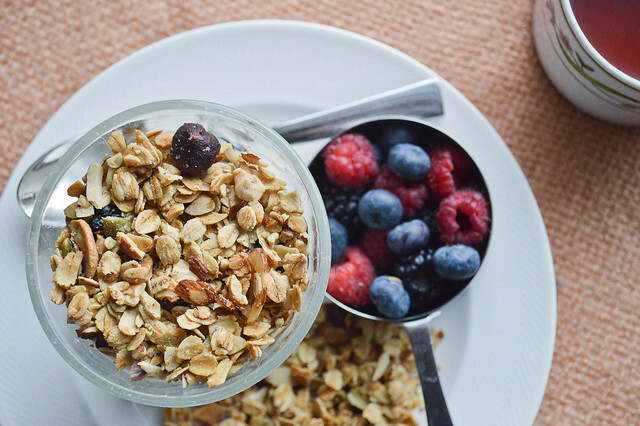 Who doesn’t love granola? I’m serious, I don’t think I’ve ever met a single person who didn’t like that sweet blend of baked oats, fruits and nuts. But store-bought granola has two big flaws: first it’s incredibly expensive for what you get, and second it’s full of sugar. And that might be why everyone likes it so much. Even your organic, gluten free, paleo, farmer’s market, what-have-you granola isn’t really healthy. This post provides you with the basic ratios to make your granola, just the way you like it, without tons of sugar! It requires a bit of time to bake, but the prep time is actually close to zero. It’s also incredibly easy and so satisfying sprinkled on top of a homemade yogurt parfait or soaked in almond milk. I usually make really big batches on the weekends because I can’t help myself and have to eat it right out of the oven. Bon appétit! Recipe barely adapted from Spoon and Saucer. In a large bowl, mix the oats, nuts, and seeds of your choice. Mix the maple syrup, olive oil, salt and vanilla extract together, and toss with all the dried ingredients until they are well coated. Spread on a baking sheet lined with parchment paper and place in the oven. Bake for about 60 minutes, or until golden brown, and stir halfway through. Once fully cooked, you can add some dried fruits and let the granola cool down before you store it in an airtight container for up to 2 weeks. 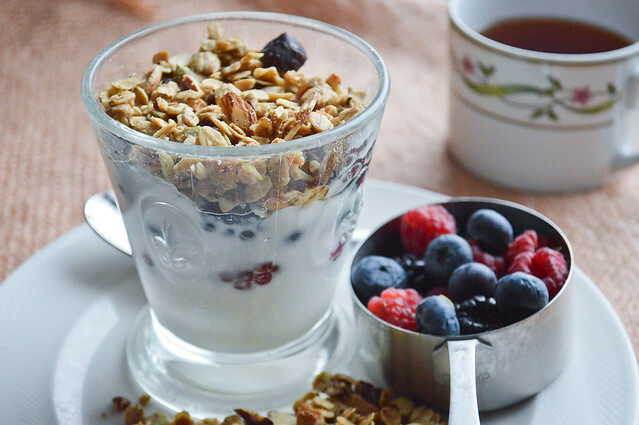 TIP: I make my morning yogurt parfait with raspberries, blackberries, blueberries, and sometimes a banana, and sprinkle it with homemade granola! As you already know, I recently discovered the joys of homemade Pesto Rosso. Since I made a little extra for the Caprese recipe I posted last week, I thought I’d use the rest in a batch of quinoa. Hence the “red quinoa” title. This recipe came together unexpectedly, as I used random ingredients that were sitting in my fridge. I’ve been so busy since last Friday that I haven’t had the time to go grocery shopping once (which further explains this “melting-pot” type of dish). It turned out to be delicious though! The onions, brussel sprouts and prosciutto were so good together that they could easily be eaten as a separate side dish! You can also omit the Pesto Rosso altogether and it’ll still be a great bowl of quinoa with veggies and crispy smoked ham. All in all, this dish made for a perfect quick and easy lunch. Bon appétit! Meanwhile, heat up olive oil in a pan. Roughly chop the onion, slice the brussel sprouts and let everything cook on medium-high heat until lightly brown. Add a splash of water and let it evaporate to further soften it all. Add the strips of prosciutto and let it cook for another minute. 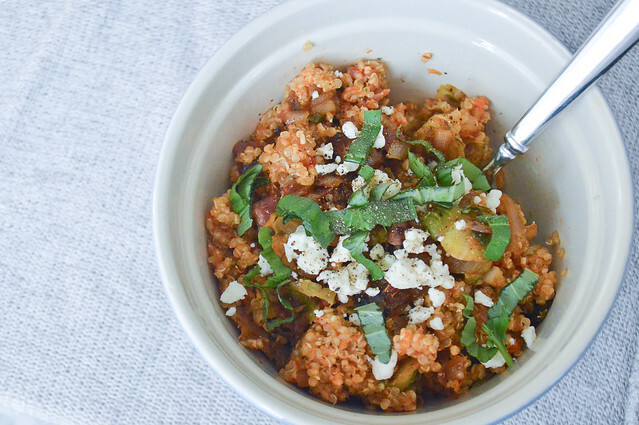 When the quinoa is cooked, toss with the pesto rosso, prosciutto and caramelized brussel sprouts and onions. Top with chopped fresh basil, and some crumbled feta cheese. As I’ve told you already, I’m a big fan of Asian gastronomy. As much as I enjoy going to the restaurant though, it’s always fun to try and recreate some classics at home. 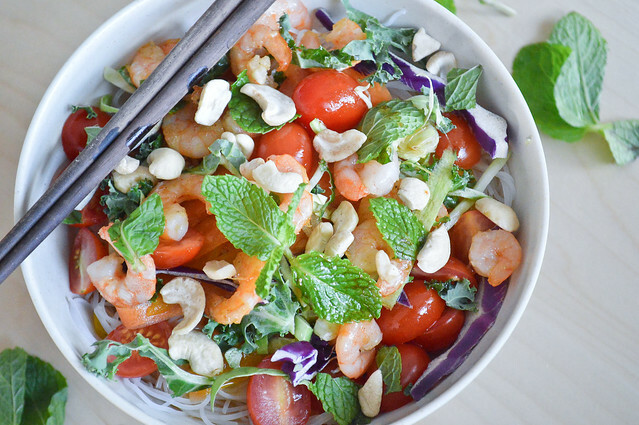 Today, the nice weather got me in the mood to try a thai inspired cold noodle salad. This was wonderfully refreshing and a nice change to my usual go-to lunch options. The spicy soy-lime dressing really makes the dish come together as it deliciously coats the noodles and veggies. I can think of a hundred ways to play around with combinations for this salad. It’s really up to your creativity and whatever is left in your fridge. Bon appétit! To cook the noodles, put water to a boil. Cover the dried noodles with the boiling water and let it sit for 3-5 minutes, or until the noodles are tender. Drain the cooked noodles, and let them cool down. Meanwhile, cook the shrimp. I use frozen shrimp that I heat up in a pan with a bit of olive oil, salt and pepper for about 5 minutes. Next, use a vegetable peeler to make ribbons with the carrot and the bell pepper, and put them in a bowl. Add the cherry tomatoes sliced in half, the chopped fresh mint, and the shredded crunchy veggies. Toss it all together. Make the Spicy Soy-Lime dressing by mixing all the ingredients well together. 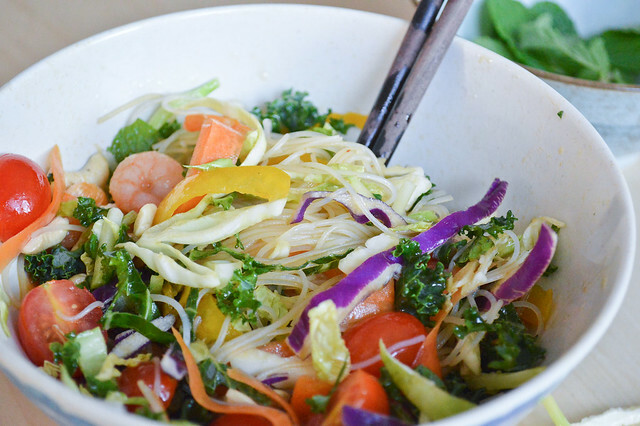 To plate, put the half of the veggies in a bowl, followed by the cooked noodles, and the remaining veggies and the shrimp on top. 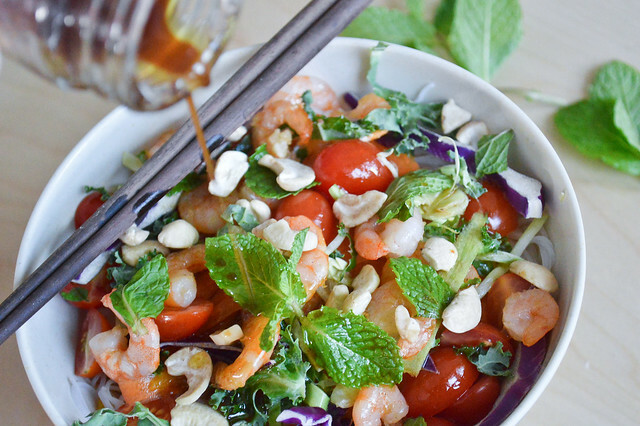 Toss with the dressing and finish with freshly chopped mint, and raw cashew pieces. 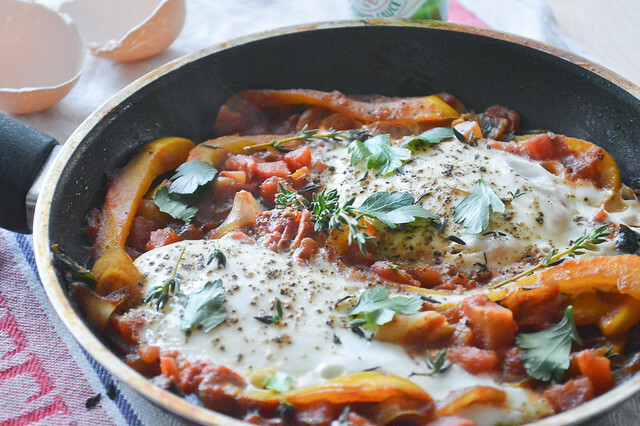 Shake it up with Shakshuka! Not long ago, my mom and I spent a weekend in New York. In between the many museums, parks and restaurants we went to, we also spent some time in one of our favorite places: a bookstore! While she loves to skim through recent books, I always run to the cookbooks section. That time, I stumbled upon Ottolenghi’s Plenty a vegetable cookbook by Yotham Ottolenghi, a London based chef renowned for his Mediterranean and North African dishes. 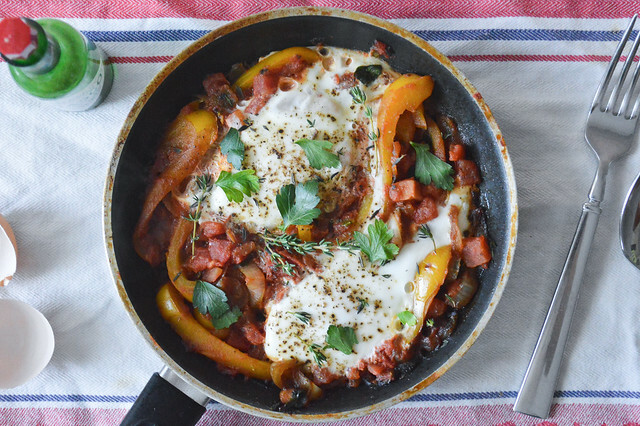 One of his recipes immediately caught my eye: his Shakshuka! I gues what first attracted me was its name. Shak-shu-ka. Such a fun name! The second thing that I liked was that it had eggs, and I’m always on the lookout for new ways to cook eggs. Before I even got the chance to try it, I went out for brunch back in Philadelphia and the café had Shakshuka too! I saw it as a sign that I needed to dive in. So I ordered it, liked it, then cooked it at home, and loved it! I slightly adapted his recipe and I hope you’ll enjoy it as much as I do, for breakfast, lunch or dinner. Bon appétit! Heat up the olive oil in a skillet. Add the sliced onion, salt, and let it cook on high heat until brown. Next, add the sliced yellow bell pepper, drizzle of agave nectar, thyme, parsley, and a pinch of ground cumin and let it cook for another 10 minutes until golden brown. Add a splash of water and let it evaporate to further soften and caramelize the vegetables. Next, add the diced tomatoes, lower the heat and let it simmer until it slightly thickens. 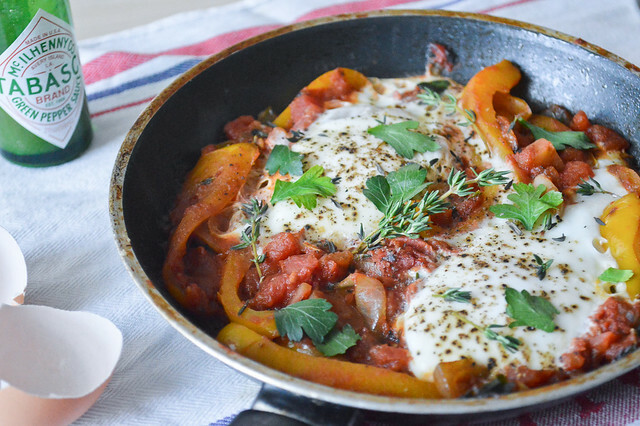 Make two “holes” in the tomato and pepper base, and crack the eggs in them. Cover and let it cook until the eggs are set, about 6 minutes. They will be runny and delicious with the sauce. Adjust the seasoning, drizzle with Tabasco if you like it extra spicy, and serve in the skillet, along with warm pita bread!